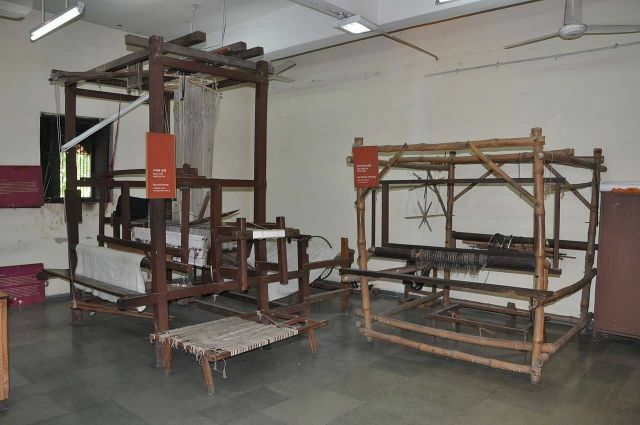 The National Handicrafts and Handlooms Museum (NHHM) commonly known as National Crafts Museum in New Delhi is one of the largest crafts museums in India. It is run by the Ministry of Textiles, Government of India. It was set up over a period of 30 years starting in the 1950s and 60s by the efforts of the renowned freedom fighter late Smt Kamaladevi Chattopadhyay. Today the museum holds over 35,000 rare and distinctive pieces reflecting the continuing tradition of Indian craftsmen through painting, embroidery, textiles, various crafts of clay, stone and wood, all housed in a building designed between 1975 and 1990 by architect Charles Correa. Various galleries within the museum include the Tribal and Rural Craft Gallery, Gallery of Courtly Crafts, Textile Gallery, Gallery of Popular Culture etc. Some of its prized collection include, the 250-300-year-old. The Village Complex also has open walls along the corridors & passages which are used as the canvas to display the painted traditions of several tribes of folk artisans. New folk artists come in every month from different parts of the country to paint on the museum’s walls.